We all started the evening watching that point in time during last season when us Pens fans were in doubt. We found our beloved Penguins in the 10th spot for the playoffs with little to nothing to look forward to. 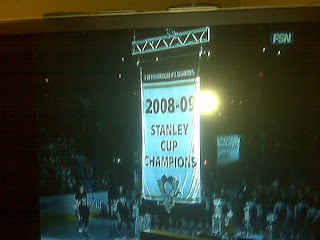 That is, until Dan Bylsma rolled into town. Then Chris Kunitz...then Billy G...then Talbot shs's...then he scored the first and second goal of game 7...then well, its all history from there. We faced many emotions at the beginning of the night, mixed feelings. 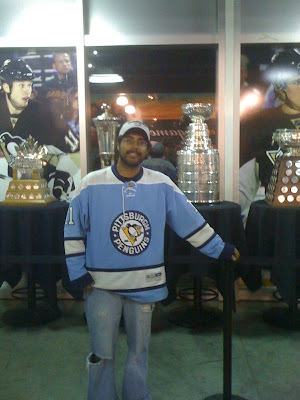 Sure it was the beginning of the season to defend the Cup, but this was also the final opener for our beloved Igloo. 40+ years in the same arena, and while we get to raise our Stanley Cup banner in the rafters, it serves as a reminder that it will only be there one season. We were choked up seeing Mario out on the red carpet with Byslma in front of the most coveted hardware in all sports. What could help us keep these emotions in check? What else but a Penguins win....and that's just what happened. Maybe this guy could too. By "guy" I'm not talking about @Superfro432. Pens came our looking real strong and controlling the game for the first 10 mins or so. Just past the 7 minute mark the Penguins got their first chance at a powerplay. The only thing that looked different from last year was the addition of Golgoski in place of Letang. Gogo seemed a little nervous initially, but was able to keep composure by handing Gonchar a nice one-timer from the blue-line only to be intentionally redirected by Geno to score the first goal of the game. We were able to see former Washington Craptial Don Brashear take on Eric Goddard in a nice fisticuffs (fist-to-cuffs). Though Brashear got the initial left hand jab in, I'd say Goddard took the fight overall. Always makes for good entertainment. After that however it seemed the Penguins were essentially non-existent. While the Rangers didn't necessarily look good, they didn in fact capitalize off of the Pens discombobulation. Eventually former Saber Drury was able to chip in a goal past Fleury off of a Higgings centering pass evening the score at 1 a piece to end the first. This period had lots of action. The Rangers however picked up where thy left off in the 1st and gained control for the early part. Fleury had what might be considered a game changing save on Prospal off of a two on one. Very reminscent of the game seven save on Ovie. Something to be noted is how well the Rangers played along the walls. They won most of the scrubs and showed more aggressiveness as a whole. Marian Gaborik himself has several good plays including sliding one between Fleury's legs on a power play only to slightly redirect outside the net. He also had a chance beating Fleury to a puck on a long pass only to be diverted by the like of Sexyhair himself, Kris Letang. After the first half was over the Pens controlled the period by making it 2-1 off of a Crosby "front-of-the-net" goal...he's always in position. Slightly over a minute later Alex Gologoski tosses one on net which was redirected by TK resulting in the 3rd gol of the night. Very defensive oriented period, though not without chances from both sides. Gaborik did slide one in at the 5:56 point to come within one goal, but that wasn't enough. Pens protected their lead through the final buzzer to give the win to their fans and the arena. Crosby was strong on the draw, 13 for 20. Powerplay needs work, but still looked strong. Jordan Staal looked real good despite not having anything on the score sheet. A few good chances. Dupuis started on Geno's line, doesn't look like he'll be there much longer. Guerin is looking his age, or he just had one hell of an offseason. Cookie had some real good chances to get his 100th career goal, but that'll have to wait. Craig Adams didn't disappoint either. Redwings lost their first game. Ha.